I can't remember where or who recommend this book to me, but I'm glad I read it. 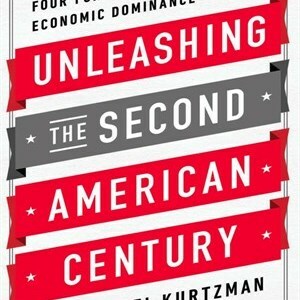 Joel Kurtzman states statistics on the American economy throughout this book. Even though statistics are often times biased because it isn't clear how they are calculated, it is an effective way to compare two different points. But the repeating theme I noticed with every argument is far more analysis as to why America thrives more than other countries. There is very sparse data showing that other countries do better than America, which makes the whole story a bit challenging to swallow. As much as I'd like to believe that America is #1 country in the World at everything, I'm almost certain there is some area where the US does not thrive. And without that argument, Joel Kurtzman's argument is too one sided. That being said, I did get an insight on where the US economy is headed that I had not considered before. My thoughts are that China's economic power is growing, perhaps too good for it's own good. American is still number one, but China is quickly catching up. And most of the statistics are based on historic data, it doesn't fully take into account what may happen in a few years. I agree that the US has a lot of pieces of the puzzle worked out, but that doesn't mean China (or other countries) won't figure out how to mimic the US economy. There's no mention of the numerous businesses that Chinese businesses are purchasing from the US. But I'll stop and I understand this book is pro-American. I'd suggest reading this book, but then finding another book that adds a counter argument to Joel Kurtzman's views. Although my notes on the book aren't organized in any particular fashion, here are some bullet points on parts of the book that stand out. For the full details, I recommend picking up a copy of the book. American's produced 20% of the world's goods inside the US (and another 15%-20% outside the US), even though we're just 4.5% of the world's population (china is 19%). Vice versa, we may make less than 20% of our good because other countries are making goods within the US. Altogether, the US has a hand in between 30-40% of the world's goods. Money made from American oversea operations stay off shore (due to current law). When that is inferred, money will come rushing back. If the US made all 30-40% of the stuff in the US, the world would be in riot. The US accounts for 21-23$ of the worlds GDP. Old labor intensive jobs that went abroad were retooled to be more automated. America is sitting on $4 trillion in cash waiting to be invested. American's think more is made abroad because they don't use the things that are made in the USA (jet turbines, cranes, medical devices, Abram tanks etc). The US has Soaring Levels of Creativity, Massive New Energy Reserves, Gigantic amount of Capital, Unrivaled manufacturing depth. No other country has all four, though they have aspects of it. Creativity is in our culture. Innovation: We have the world best schools (for computer science, top 5 schools, plus half the remaining 20 schools), despite the fact we're only 4.5% of the worlds population. Students from abroad want to study in the US because we're push the boundaries of schools. MIT since founded has alumni who started 25800 companies. Education is an investment, not a cost. Keeping the door open between universities and businesses is American. In other countries, researchers won't want to leave to start their own businesses. These business then bring about economic change including high waged employers and billions of dollars in products. China has many patents, but many of them would not be granted in the US. China is investing in labs and universities, but for the most part are unsuccessful. A reason the US is successful is because our society is open to change. We invent new industries. 13.4% of startups in Silicon Valley are Indians who immigrated to the US. The problem is the company structure tends to be hierarchical, and do what they're asked of. Speaking your mind is not encouraged. Similarly, the US is where immigrants have the opportunity to start new companies. In the 2008 Financial Crash, there were a high number of positive trends (rising exports, investments in American manufacturing, new technologies to tap like oil). Depressions make private sector debt disappear so growth can return. From 2009-2015, debt had fallen 84%, or ~2.3 trillion dollars. Too much money to repay debt. 14.2% in 2008. In 2013, due to falling interest rates, we spent 10.3%. TARP transferred debt from banks and private organizations to the federal government. If loan's are paid back, its a taxpayer problem. It's okay because government can create money and change the rules on how banks operate. The job of the government is to keep the economy running, not to teach a lesson to rule breakers. There are other systems designed for that. Oil contributed to the crash. In 2003, oil was $33 a barrel. In 2007, $100/barrel. July 2008, $145/barrel. Food is 25-35% of average household income, depending on oil prices. Housing is another 34-37% of family budget. Food and oil are a necessity, so people spent on that. You can not pay a mortgage and still get by for a year while the bank attempts to kick you out. Operating abroad is expensive. Boeing discovered that manufacturing in China/Europe caused timeline challenges, so they brought manufacturing back to the US. In China, Chinese companies did not like/use foreign created parts (in china). To manufacture in China, you need a Chinese partner in China for at least 51%. Chinese courts also often overlook it when Chinese companies don't pay foreign companies the damages awarded in court. There is also the high prices in China real estate, so they were losing competitive edge because China was becoming more middle class. India on the other hand, doesn't have enough talent. Auto industry revitalized by bankruptcies. Were able to re-write bad management mistakes like labor contract, restructured pensions, and health care liabilities. Unemployment in high school graduates doing construction work and new college graduates were the one who found the most difficult time finding jobs. Everyone else was mostly okay. When the economy recovered, new construction jobs (that were long overdue) picked up and many of those people found work again. Unemployment is a function of age and education. The least educated, youngest, and least experienced are hit the most. Advances in science and technology (Japan), new energy sources (Saudi Arabia), pools of capital (Switzerland), and creativity (Israel) are all areas America excels in. American's are more creative because the people are into self improvement. Americans are more likely to get up an move for a job (2.5% in America vs 0.5% avg per country) in the EU. When we change jobs, ideas are spread. Ideas lead to new companies overtaking monster companies. People in the EU won't move even if the unemployment rate is 50%. Additionally, companies in the US aren't government controlled (like in China or EU). Government control means uncreative and failing companies can be artificially propped up by the government. Because we are so creative, foreign companies in EU and China wait for the next big invention so they can copy it or even steal it. The best way for American companies to fight copycats is to out innovate them. And companies must continue to innovate, otherwise they get taken over by other companies (Ford to Tesla, Sony Walkman to Apple iPod, Lockheed to SpaceX, Barnes and Nobles to Amazon). The huge gains in robotics has large growth in Boston because of MIT and their robotics department, this is an example of how in America, educational institutions and commercial companies are linked. This is not the case in other countries. And robotics is huge in the US, but there are not that many foreign companies who have reached the same advanced levels. As of Nov 2012, 373 in the US, 81 in Japan, 67 in Germany, 41 in Canada, and 40 in France. Look up Boston Dynamics, Rethink Robotics. Robots may take the place of oversea manufacturing jobs and bring them back to the US in a more efficient and cost effective manner. By moving companies, you get a better understanding of the industry which in the end advanced the whole industry with competition and innovation. Innovate by creating something new (Ford and the Model T) or incrementally improving an existing product (Dell create an super efficient process). Just in Time (JIT) Manufacturing started in Japan to help with limited space, but American companies embraced and improved it's processes. It is estimated that the use spends $436 billion on research, followed by China at $198 billion followed by Japan at $157 billion. America is on its way to becoming energy independent, which isn't the case of China or India. Fracking has made it possible to quickly extract untapped reserves of oil. $335 billion dollars of oil is 1/2 of our trade deficit. What happens when we become energy independent or even begin exporting energy? Natural Gas is cheap in the US, but expensive elsewhere around the world. The amount of oil we import is dropping. and energy use declining (thanks to increased energy efficiencies). The higher the price of energy, the more consumer good cost, and the less disposable income is in the hands of consumers. The Strait of Hormuz connects the world with oil, and the US has a nuclear powered aircraft carriers and a fleet of other protective ships to protect the strait at a cost of $7.3 trillion (1976 to 2007). US Taxpayers foot this bill and we do not get a discount on oil and other countries can take advantage of our protection. Oil prices are manipulated by OPEC, and other nations we import from either treat women poorly (due to their religion), or don't spread the wealth (few rich citizens, mostly poor citizens). Ethanol production is also becoming more efficient in the US, current 1 to 2 energy, some believe it will reach 1 to 4. Economic growth requires capital and transparency. In 2009, it is estimated the American companies have $5 trillion in cash ($1.5 in the US, $3.5 abroad). Money is kept abroad to avoid double taxation (once in the foreign country and again if transferred back to the US by the US government). During the downturn of 2008, many large companies restructured their debt (bonds) by purchasing lower percentage. This is similar to refinancing a mortgage loan. When you have growth, may problems (such as debt) is solved. There is a lot of money in savings (money markets, mutual funds, retirement accounts, ETF), about $7 trillion in the fall of 2013. Plus the stock market is worth about $19 trillion at the end of 2012. To avoid double counting, the Feds reported households in the US collectively had a net worth of $64 trillion. So how is America broke? Resourcing is the moving of manufacturing back to the US, where there is more security and trust (not a strong point in China). In the US, factory workers are more efficient (thanks to better technology) and can do it for less than other developed countries like Germany. Then, when products are made in the US, you won't need to ship them back to the US. This means faster speed to market (no customs, fewer weather delays, moisture from being at seas, bribes). This means companies will purchase from local suppliers. This is the multiplier effect. The author goes into 3D printing (pros and cons) of the new disruptive technology. How if and when the thing takes off, the first major consumers of 3D printing will be in the US. However, the US is not training the next generation of innovators to fill all the available jobs. So the only way is to make immigration easier for those with the skill set we need. The US economy doesn't care if you're nice or not, it just cares about what you can do. America must continue to educate it's population if it wants to stay in power.